Ready to show up to all areas of your life with unshakeable confidence? True, lasting change doesn’t happen on an island. You’re going to need cheerleaders, honest accountability, and expert advice to finally nail those health and wellness goals you wrote down. Okay, we’re officially one month into 2019. How are things going for you? How confident are you feeling about keeping yourself on track for the rest of the year? is a community of women who want to show up to every part of their busy life while building their dream body through fitness, nutrition, and mindset overhauling. You’ve got goals for yourself and they matter. How are you doing tracking them solo? You don’t have to give up on all those goals dreamed up. I’m here to help. Eat your favorite foods without having to stick to restrictive (and unrealistic) diets. Gain hours back from the gym in favor of quick, efficient workouts. Stop hating what you see in the mirror and start appreciating your killer body. FINALLY, understand how to fuel your body and take your performance to the next level. Enjoy a cocktail and tapas during a girls’ night out without experiencing guilt the morning after. Say yes to date nights with your guy without dreading the walk to the closet. Make yourself a priority without stress or shame. Improve your confidence while boosting your productivity levels. Gain knowledge from mentors who are trained to empower and equip you. Let’s get right to it: I’ve been in your shoes. I’ve wasted hours googling diets and workout programs that “promised” me success. I craved the better body and scrolled through the dozens of social media accounts asking myself, “Why not me? Why can’t I finally see some results?” Truthfully, I was a mess. Have you reached that burnout point? Are you tired of constantly reaching for something that feels unattainable? I’m meeting you here, in this space, to tell you the truth: you can change. It doesn’t always have to be this way. After enduring years that felt like failure stacked on failure, I finally had a breakthrough. I started losing fat, building muscle (without bulking), and finally enjoying my favorite foods without the guilt and restrictions of a diet. You can lose weight by eating anything you want! You’re going to enjoy your indulge in the chocolate, taste the cheese, and try the wine—all in moderation. Also, today we kill the lie that carbs are the enemy making you unbutton your pants at the dinner table. I remember when I was trying to build my dream body on a zero-carb diet… yes, zero carbs! I couldn’t function like a normal human, it was horrible…I felt like a zombie! You see, your body needs carbs. Carbs don’t make you fat. There is no single food that will make you fat. It’s the overconsumption (eating more than your body really needs) that forces your body to gain fat. I’ll teach you to calculate how much you need to eat to meet your body’s unique standards. You don’t have to kiss your social life goodbye to get the body you’ve been wanting. I’ll help you understand what you need to fuel your body instead of starving it. You’ll learn how to eat food in moderation instead of depriving yourself of the things you love just to get the results you want. If pizza and ice cream (my two favorite foods) are wrong then I don’t want to be right. I hate to say it but you’ve been lied to by health coaches. You’ve been forced to limit carbs, eat less than 1,200 calories per day, eat from a list of “approved foods” and stop eating after 5:00 PM if you want to see that scale budge. The truth is, it is not about limiting your caloric intake…it is about eating what your body actually needs to function optimally. Your body is different than anyone else’s body so you have to customize the foods you eat and when you eat them. The most simple and effective method to lose weight and tone up your body is through lifting weights. I’m with ya, sister. I had the same fear. I can still remember sitting down on the bench that first time in the weight room staring at that dumbbell rack like a deer looking at the headlights, while men with bulging biceps hulked 80-pound dumbbells around the room, grunting and sweating. Still, I knew something had to change. I decided to just start experimenting. I picked up 5-pound dumbbells and began to copy what others were doing. A few weeks later, for the first time in my life, I began to see tone and definition. In my own training, I’ve learned that lifting weights helps your body change. It boosts fat loss and shaves inches off your hips, waist, all of it. It was the missing link between me and that favorite pair of jeans I was dying to wear again. You’ve been told lifting weights will make you “big” and “bulky” and that if you pick up a dumbbell, you’re going to wake up with bulging “man” legs…Turns out, lifting weights will actually SHRINK you. Yup, you heard me. It will help you tone up and lose fat. Not only that but, each time you finish your workout, your metabolism gets a boost and your body kicks in to repair your muscles. You’re burning for 36 hours after the workout. Now compare that to a piece of cardio equipment that takes you nowhere…literally! This means you get to go home, watch one of your favorite shows on Netflix, and burn fat while sitting on the couch. Once you start working out with weights, you’re going to see results! And we will be here to cheer you on the whole way through! Many programs and e-books have been setting you up to fail from day 1. I remember the first time I bought an ebook online that claimed to help me lose weight and fit back into my favorite little black dress. After the first week, I was feeling uninspired and lost my motivation to continue following it. I quickly realized the creator of the program didn’t care whether or not I followed through. They didn’t care to challenge me with accountability. They weren’t anywhere to be found. My support system was lacking and my results were suffering. You need what we all need…a tribe. A sisterhood. People you can call a family. A group of like-minded individuals who are going to cheer you on, hold you accountable and scrape you off the floor when things get ugly. A recent study shows that having a community focused on accountability and support increases your success rate by 47%! That’s basically half! You need people and you deserve to have people in your corner who are invested in seeing you get better by the day. I created The Thrive Tribe just for health and fitness enthusiasts like you. all of my secrets. Every month, I’ll teach you something new that you can implement into your lifestyle to achieve and maintain the body of your dreams, eat the food you love, trade extra hours in the gym for a thriving, full life! The Thrive Tribe is a membership built to help anyone looking to build the healthy lifestyle and body of their dreams without dieting or spending insane amounts of time in the gym while they could be spending quality time with their loved ones instead. No matter where you’re at in your journey—from beginner to experienced enthusiast—we’re going to teach you to overhaul your health goals and invest in a solution towards sustainable wellness and freedom. * Prep for success with your exclusive week-long Tribe Menu complete with photos, recipes, macros and grocery list! * 4 Exclusive Tribe Time Episodes released each month to help you gain confidence, stay inspired and continue learning + growing in your lifestyle journey. 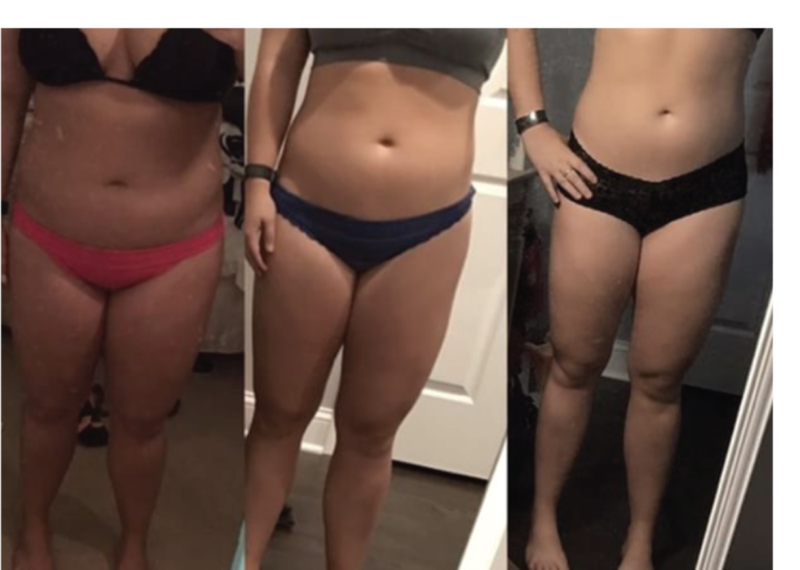 * 4-weeks worth of workouts utilizing our exclusive Tribe Method, which is an effective blend of HIIT & weight lifting that tones and sculpts your body! * Interactive Tribe Training: 1x month to get any and all questions answered by me! * 24/7 community with virtual meetups! PLUS: We regularly roll out bonuses and shower annual members with surprises as a thank you for going all in and investing in a full year up-front. A community of like-minded sisters rallying for you? A safe place for you to work on becoming a better version of yourself? A family where you can come to for accountability and tough love? A resource-filled hub with 24/7 inspiration? The Thrive Tribe is not just another random diet or workout plan. This is an exclusive community of women who believe in food freedom, fewer hours in the gym and showing up for the parts of life that matter most—family, friends, work, all of it. LET’S MAKE YOUR MEMBERSHIP OFFICIAL! We’ve rounded up the most frequently asked questions by our community and put them in one space for you. Got a question you don’t see answered below? You’re always welcome to email me at thrive@juliealedbetter.com. + My goals may be different from someone else, how do I know The Thrive Tribe will work for me? We will show you how to tailor your nutrition to your body, goals, activity level and eating preferences. We don’t believe in one-size-fits-all programs and so it’s our goal to see you in the process and give you the tools to get customized results fit for you. + What if I don’t like one of the workouts or recipes? No fear! The workouts and recipes are meant to be suggestions. You can mix, match and experiment on your own. Plus, every month you’ll be getting new content so it’s never too long before you can shake things up again! Every person’s journey is different. What’s most important is that you love the process of getting there. + I’m afraid of following my customized macros because I’d end up being hungry, will it happen to me? This is one of our favorite questions to answer! We will teach you how to listen to your body for cues, eat enough food and stay hydrated without needing to constantly raid the fridge. + What if I don’t need to lose or gain weight… Can I still join The Thrive Tribe? + Do I need to buy supplements after joining The Thrive Tribe? Nope! We do make recommendations but we’re clear about it and we want you to save money. Supplements only contribute 5% of the results you’re looking for and we’re focused on nutrition and training to make sure you’ll see the results you deserve. + What if I have a health condition? We’d love to have you join The Thrive Tribe but we ask that you please consult with your doctor first! + How can I cancel my membership? Canceling is easy but we hate to see you go! Please send an email to: members@juliealedbetter.com by the 27th of the month to cancel your membership for the next month!